MOSCOW, April 10. /TASS/. 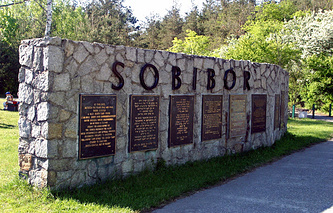 The Russian Military Historical Society has sent a formal appeal to President of the European Council Donald Tusk following Poland's decision to dismiss Russia's requests to create a joint exhibition in the Sobibor Museum founded at the site of the former Nazi German Sobibor extermination camp. The organization is also going to appeal to the UN, the Russian Military Historical Society Scientific Director Mikhail Myagkov told reporters on Wednesday. "We sent a letter to Donald Tusk, who was the Polish Prime Minister back in the day. We hope that common sense will prevail and that he has savvy aides around him who will suggest that the times are changing and that constant pressure on Russia won’t lead to anything good. <…> We are also planning to call on higher organizations, and the highest one in the world is the UN," the historian said. According to Myagkov, the decision to decline the Russian requests is political which is being covered up by formal excuses. "We were excluded from this project for formal reasons. We received a document saying that we hadn’t replied to a letter stipulating that the timetable for submitting documents had been changed. We sent our response immediately and received a letter back that said that we had been practically expelled from this project for formal reasons. <…> Amid all the tensions between Poland and Russia now I believe that this decision is purely a political one. All the Russian documents were thoroughly compiled," he said. Myagkov pointed out that all attempts to degrade the Russian role in Europe’s liberation from the yoke of Nazi Germany can have serious ramifications in the near future. "If there are no monuments and no textbooks explaining the Russian role in World War II, the younger generation will know nothing about the Soviet troops who liberated Europe. There will only be textbooks saying that it was the US that freed Poland. Period. In any case, the Polish education system is working to achieve precisely that," he added.